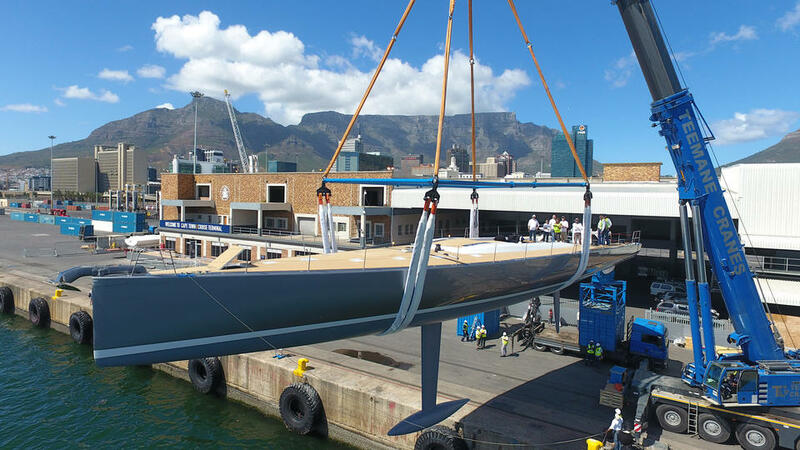 South African sailing yacht specialist Southern Wind has a 27.5 metre custom sloop called Allsmoke. Splashed in Cape Town on November 6, Allsmoke features naval architecture by Reichel-Pugh Yacht Design and interiors by Nauta Design. The yard added that Allsmoke’s owner is a repeat client whose brief called for a modern racer/cruiser with exceptional performance and all the comforts of a superyacht. Allsmoke features a 6.96 metre beam as well as a lifting keel, which means that her draft can be reduced from 5.8 metres to 3.8 metres, making shallow anchorages more easily accessible without deploying the tender. Key features include a detachable bowsprit that can reduce the LOA to 26.5 metres. Accommodation on board Allsmoke is for six guests in three en-suite cabins. The owner’s suite includes a superyacht office with a convertible settee that can increase the capacity to eight guests. The separate aft crew quarters allow for a staff of up to four, however Allsmoke’s ergonomic deck layout means that long voyages at sea can be handled with even fewer crew.Auxiliary power comes from a 190hp Steyr SE196 E35 engine, while the lightweight composite construction includes an outer skin made from carbon/epoxy resin. Following her launch, Allsmoke will now undergo sea trials off Cape Town before setting sail for the Mediterranean Sea for the official handover. Other projects currently under development at the South African yard, which recently celebrated its 25th anniversary at the Southern Wind Capri regatta, include the SW96 and SW105 cruiser racers.